Erected by the Trustees of Richmond College. Location. 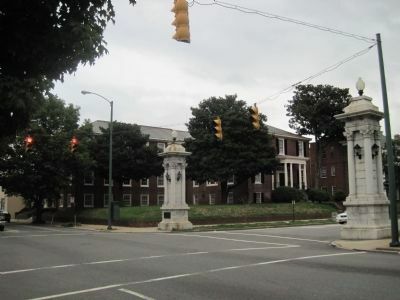 37° 33.199′ N, 77° 27.405′ W. Marker is in Richmond, Virginia. Marker is at the intersection of Lombardy Street and Grace Street on Lombardy Street. Touch for map. 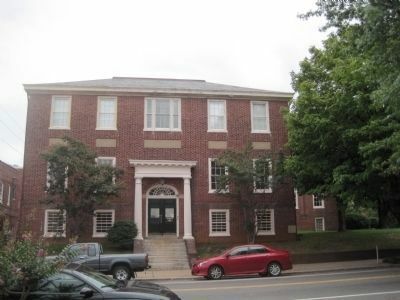 Marker is in this post office area: Richmond VA 23220, United States of America. Touch for directions. Other nearby markers. At least 8 other markers are within walking distance of this marker. Maj. Gen. J. E. B. Stuart (about 500 feet away, measured in a direct line); Lee (approx. 0.2 miles away); The Equal Suffrage League of Virginia (approx. 0.3 miles away); First Regiment of Virginia Infantry (approx. 0.3 miles away); Hartshorn Memorial College (approx. 0.3 miles away); Richmond Howitzers Monument (approx. 0.3 miles away); Maggie Lena Walker (approx. 0.4 miles away); Monroe Park (approx. half a mile away). Touch for a list and map of all markers in Richmond. 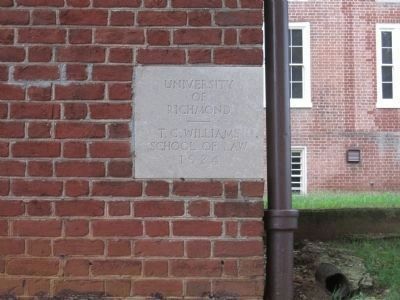 Behind the gateway is the old T. C. Williams School of Law building. More. 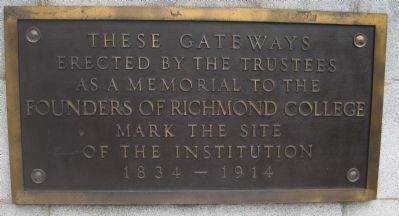 Search the internet for Site of Richmond College. Credits. This page was last revised on June 16, 2016. This page originally submitted on January 28, 2011, by Kevin W. of Stafford, Virginia. This page has been viewed 373 times since then and 7 times this year. Photos: 1, 2, 3, 4. submitted on January 28, 2011, by Kevin W. of Stafford, Virginia.